For the first time we are presenting on cassettes the recording of the Recitation of the Noble Qur'an and the translation of its meaning in the English language by Dr Muhammad Taqi-ud-Din Al-Hilali and Dr Muhammad Muhsin Khan. 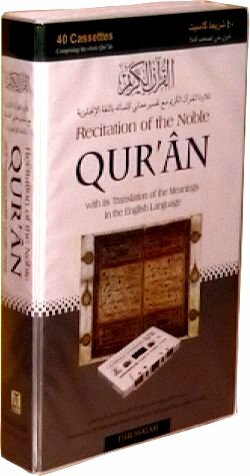 The recitation of the Noble Qur'an is done by Sheikh Nadir Al-Qallawi, and the translation is read by Mr Phelps (Bilal Abdul-Karim) from USA. The presentation has been supervised by Mr. Abdul-Malik Mujahid, the Chief Executive of Darussalam.